Burn time 15 hours each ! This votive is approximately 2 oz. It is the standard votive size and has a burn time of up to 15 hours. This candle is the perfect size for a subtle aroma in any room. Choose the color of the chunks and the over pour will be ivory. 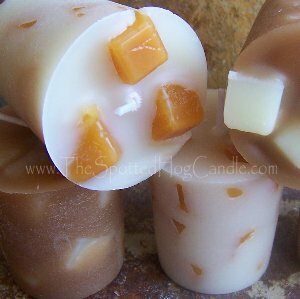 When the candle melts the chunks melt into the wax creating a new beautiful variation of the shade you selected. Every 12 pack comes boxed in 2 rows of six wrapped in beautiful tissue paper or bakery bags x 2 with tissue and labeled. Absolutely the best holder for votives! 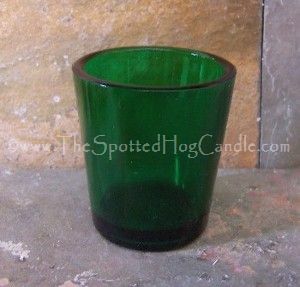 Thick walled, tight-fitting, quality glass votive cups. The glass itself is colored all the way through not painted or stained like others. Absolutely the best holder for votives! 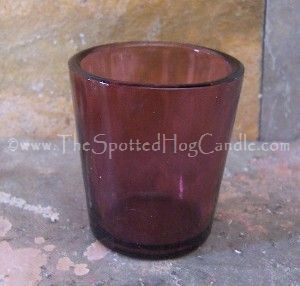 Thick walled, tight-fitting, quality glass votive cups. The glass itself is colored all the way through not painted or stained like others. !